Edwin Forbes was born John Edwin Forbes in New York City in 1839. As a young man, he studied painting in the classical style with emigre artist Arthur Fitzwilliam Tait, a well-known British landscape and wildlife painter. Edwin Forbes was twenty-three years old when he shouldered his portfolio of papers, pencils, chalks, and inks, and went to war as a special artist for Frank Leslie's Illustrated Newspaper. He stayed with the Army for two and a half years and produced hundreds of drawings for his newspaper that were turned into woodcuts for printing. 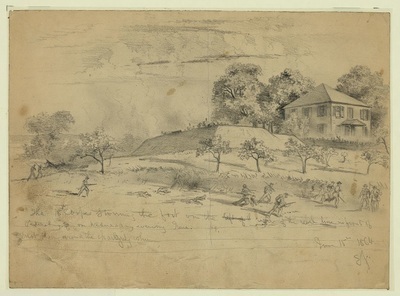 His surviving drawings show great skill at capturing terrain, architectural, and human details. As was typical, the woodcuts did not do his drawings justice. Forbes was intrigued with capturing intimate portraits of individual soldiers in camp and daily life in the army. He trekked with the Army of the Potomac throughout the Overland Campaign and sketched in front of Petersburg for six weeks, leaving before the Mine explosion of July 30. He left the newspaper without explanation and was replaced by artist Edward Mullen. 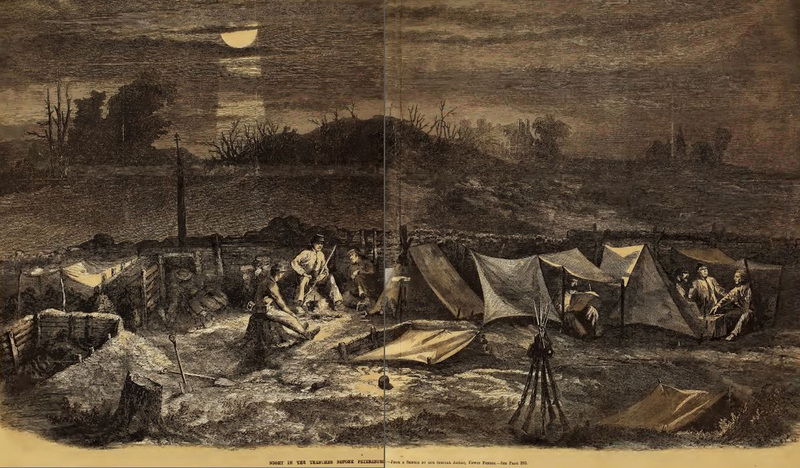 The last woodcut made from one of Forbes' front line sketches was printed in the July 23, 1864, issue of Frank Leslie's Illustrated Newspaper. The Library of Congress curates 341 of Forbes' drawings, thirteen of which were completed at Petersburg. 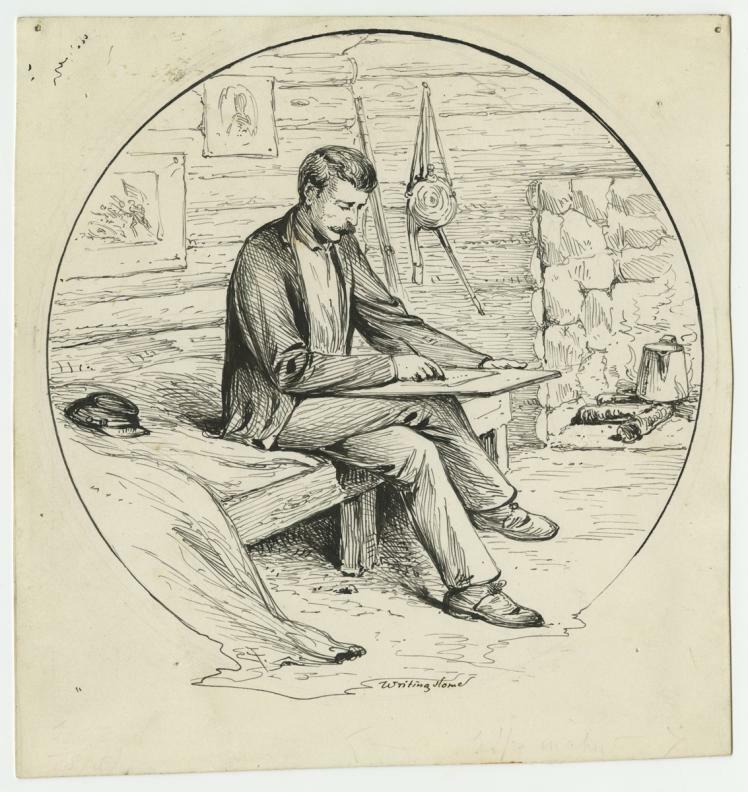 Edwin Forbes, "Writing Home," self-portrait, courtesy of the Virginia Historical Society. He appears ensconced in very comfortable winter quarters. 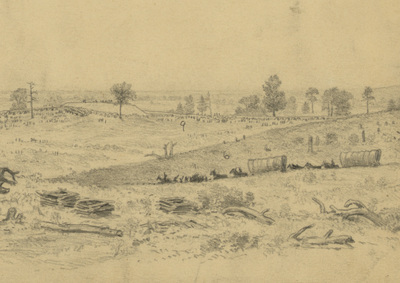 22nd USCT carrying an advanced line of Confederate works in Baylor's Field on the City Point Road, June 15, 1864. Woodcut from a sketch by Edwin Forbes, Frank Leslie's Illustrated Newspaper, July 9, 1864. 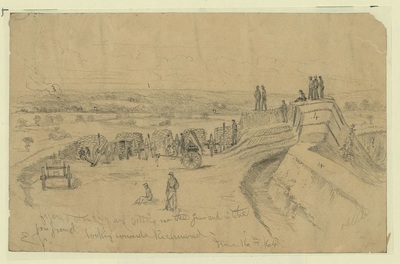 LC 22561 "Sketch of the forts and breastworks near Petersburg, June 15, 1864," drawing by Edwin Forbes. Key to the above Forbes drawing from the collection of Petersburg National Battlefield Park. Detail 2: LC 22651, slashing and piles of stove wood. up in heaps to dry… (p. 386)”. ​Thompson, S. Millett. 1888. Thirteenth Regiment of New Hampshire Volunteer Infantry in the War of the Rebellion. Houghton, Mifflin and Co., Boston and New York. Detail from LC 3a16934. Inscribed below image: The siege of Petersburg, Va. Advance of the Union on the right, near the Appomatox River, on the morning of June 18th, 1864. Showing the captured works and the part of the city near the river. 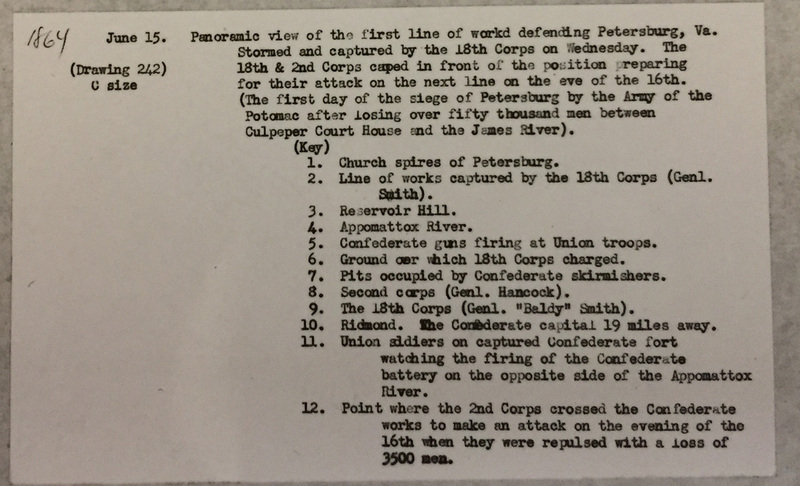 The detail from the map prepared by 18th Corps engineers, titled "Sketch of Road From Ponton Bridge at Point of Rocks to Petersburg Showing Line of Works Captured by the 18th Army Corps", re-oriented with west at the top of the detail, clarifies the accuracy of Forbes's sketch. 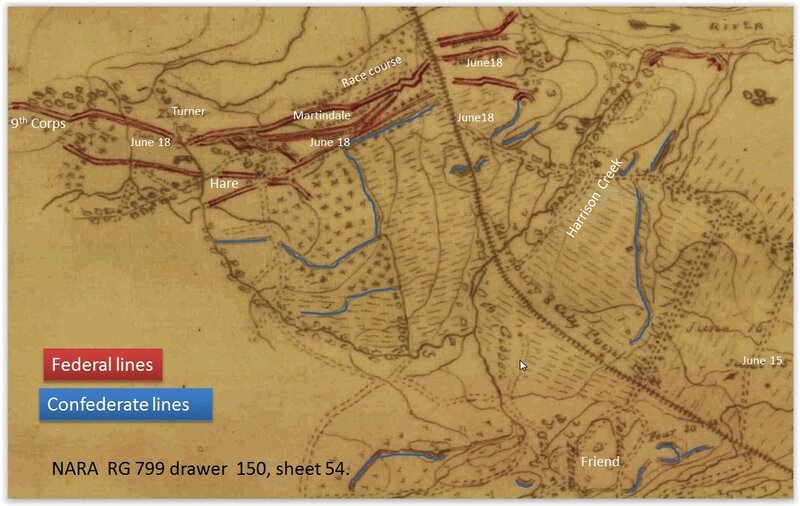 This map provides many details about the 18th Corps sector of the battlefield, including Confederate interim lines and Federal combat trenching. U.S.lines were colored red on the original; blue has been added to the C.S.A. lines to enhance visibility. 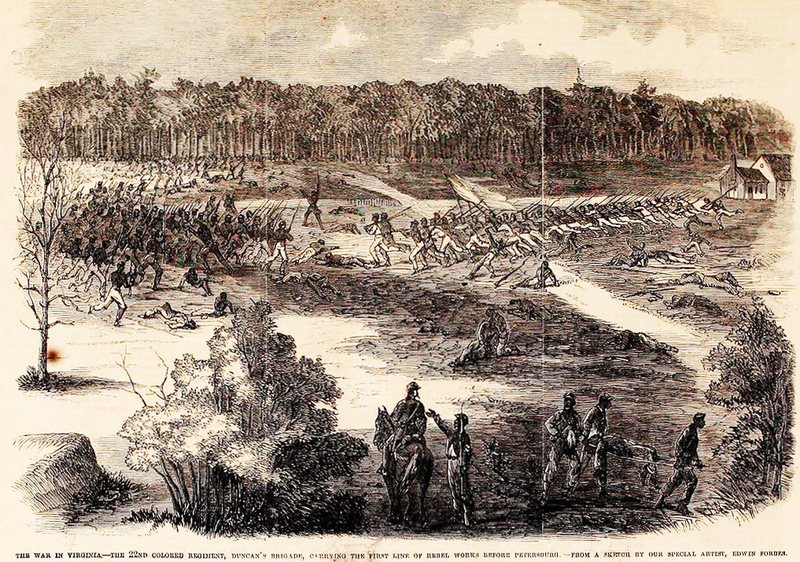 "Burnside's Corps charging the rebel position on the right of the enemy's line." Woodcut in Frank Leslie's Illustrated Newspaper, July 16, 1864, from a sketch by Edwin Forbes. 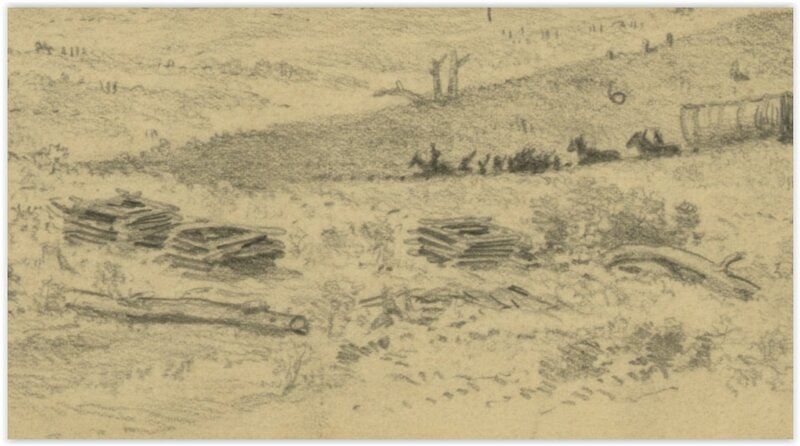 "Night in the Trenches Before Petersburg" from a sketch by our special artist, Edwin Forbes. Frank Leslie's Ilustrated News, July 23, 1864, pages 472-473 -- one of the last of Forbes' front line sketches to be used by the paper.